Growing up in the home of a Private Security professional William was exposed to a different way of thinking than most from a young age, beginning his firearms training and studying executive protection at the age of 8 he was set apart from the traditional way of being raised. Martial Arts was also a passion in his childhood leading him to learn the professional fight world working for a Pro MMA company with some of the world’s best fighters watching them train and fight in the cage for championship titles. Understanding the dynamics of real world protection William was led to his career in Private Sector Security starting in 2003 and has over a decade of experience defending clients and protecting their assets. 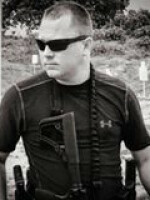 As a certified Law Enforcement Firearms Instructor William specializes in advanced handgun & carbine training combining old school and modern day concepts that allow him to get students up to speed on gun fighting in the classroom and on the range with a unique set of skills and a tactical mindset. 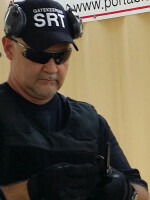 Having spent 40+ hours in uniform as an armed Commissioned Officer through the Private Security Bureau in large Christian venues for several years and now providing Executive Protection as a Personal Protection Officer to high profile clientele as his primary role William stays sharp and focused on today’s threats. With ever rising dangers around the globe he brings an Anti-Terror attitude and emphasizes on protecting Christians. From the Sanctuary to the streets of Dallas, William believes that incorporating combat proven, solid tactics with live fire training is the only way to meet today’s challenges for Christian Security combined with a strong passion to serve and demanding only the best for his students. He enjoys all things tactical and Instructs at the Christian Security Institute as a State Level 3 & 4 Instructor. Chuck and Marian have been married for over 25 years and throughout their lives together, they have worked together in various businesses and industries. 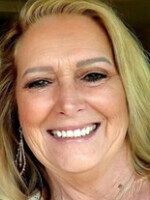 Marian's career extends from Top Producing recruiter for 20 years in the DFW area, computer networking, training and web design to owning a retail boutique shop for 10 years in Frisco. Marian was raised in Texas with strong Christian roots and as Chuck says, "We have a mixed marriage, she was raised Assembly of God and I was a Methodist ministers son." We both came to Christ fully in our 30's and haven't looked back. God has been so good to us and shown us unconditional love and favor in all we have set out to do together. Amazing story of God's grace and mercy to two sinners searching for meaning and direction as youths. You need help at NOCSSM concerning conferences, membership or general information? I'm here to help! You need help at Christian Security Institute? Scheduling training at the range, firearms training? I'm here to help! You need help at Gatekeepers Security Services? Gatekeeper Program, scheduling training, paperwork or licensing. I'm here to help! You need help at American Society of Christian Gatekeepers? Membership, Chapters, events? I'm here to help! Scheduling, billing, website, seminars, conferences, phone a friend or QUESTIONS? I'm here to help! Brian provides executive protection for the pastoral staff and visiting guest speakers. He is black belt with over 19 years of training and teaching experience. Brian is a Connections Pastor for Trinity Lighthouse Church, Denison, Texas. As the previous Director of Security, he oversaw all aspects of safety and security for campus operations. Brian provides executive protection for the Senior Pastor and the Executive Pastor. He is a devote Christian, father, husband and steadfast friend. 12 years close contact knife and hand gun training. Current and actively trained in multiple weapons systems with Specialized dignitary and executive protection skills training. Chuck is the founder and president of the National Organization for Church Security and Safety Management™ which has helped thousands of churches throughout America with security and safety issues that concern all churches both large and small. He is the licensed security manager and president of Gatekeepers Security Services™ whose Gatekeepers Program™ has put hundreds of armed Gatekeepers in churches across Texas. He is also the president of the Christian Security Institute™ which is a state licensed armed security school which trains, certifies and licenses church security operators. Chuck was the past Director of Security for Mega church in Grapevine, Texas and lead the security efforts for local church in Frisco, Texas as their Volunteer Director of Security. 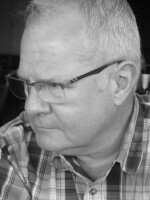 His three decades of private security experience, including twelve years in the Church security field enables him to address the unique security issues faced by churches of all sizes. Certified Defensive Tactics Instructor - PPCT Management Systems, Inc.
21 Zechariah son of Meshelemiah was gatekeeper at the entrance of the Tent of Meeting. 22 All those chosen to be gatekeepers at the thresholds were 212. They were enrolled by their genealogies in their villages [around Jerusalem], these men [whose grandfathers] David and Samuel the seer had appointed to their official duty. 23 So they and their sons were in charge of the gates of the house of the Lord, that is, the house of the tabernacle, as guards. 24 The gatekeepers were stationed on the four sides —on the east, west, north, and south.